← Does It Count As a Tearjerker if the Book Punches You Until You Cry? Vampires in books are still alive and kicking and biting, even in the post-Twilight era, and we have Holly Black to thank for a unique spin on the old legend. Coldest Girl in Coldtown is the story of Tana, a teenager who awakes after an all-night party and notices that her friends are now corpses. All except her ex-boyfriend Aidan, who is alive but bitten, or, in the book’s terminology, Cold. People who are Cold are in a sort of netherworld between vampire and human. If a Cold person can ride out the infection for 80+ days and fight off the urge to drink some delicious human blood, he won’t turn into a vampire. But if he or she sips that ruby red juice, then hello vampire. Since the regular old humans aren’t thrilled about the Cold people running around and potentially becoming vampires, they quarantine them in Coldtowns, walled-off cities that are the decadent dwellings of the Cold, the vampires, and any humans crazy enough to join the party of their own free will. Think Las Vegas with more blood. Except also like the Hotel California. Anyway, after the worst party ever, Tana finds Aidan in a room with Gavriel, a mysterious vampire in need of some rescuing. The story chugs along from there as the three of them take a road trip to Coldtown, meet some bloggers who want to become vampires, and find out more about Gavriel and the vampires in charge of the whole mess. Overall, I’m a fan of this book and would recommend it to anyone who enjoys vampires, YA, and/or Holly Black. For most of the book, I found myself flipping eagerly through the pages to find out what happens next. However, this was definitely a book that started strong (awesome party scene!) and petered off as the story progressed. The book feels like it’s divided into unofficial thirds—the party/road trip, Coldtown exploration, and vampire politics at a party. I liked the party and road trip, I was partial to the intro to Coldtown, but the vampire party at the end seemed a little rushed. Key plot events were too easy for characters to accomplish, and characters’ decisions were somewhat unbelievable at times. At other times, the plot meandered, especially in the Coldtown exploration section. As for characters, the vampire Gavriel was hands-down my favorite. He was the typical dark, brooding vampire, but with an interesting touch of crazy and great lines. Tana was serviceable as a protagonist, but she felt somewhat bland. I couldn’t say why exactly, but nothing about her made me feel anything, even her sad backstory. Aidan, the ex, was super annoying, and the blogger characters (brother-sister pair Winter and Midnight) weren’t my favorites either. But, put everything together and it’s still a decent book. Black’s writing also takes the book to a higher level. She has a great sense of which specific details to highlight to make a scene pop in your mind’s eye. 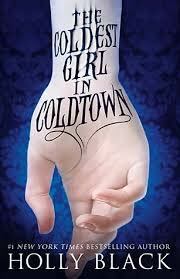 So, give The Coldest Girl in Coldtown a try if you’re partial to the genre, intrigued by the unique Coldtown idea, and like a little vampire-human romance. And I promise you that the vampires in this book do not sparkle.